I feel like I haven’t been at home at all lately… even though I haven’t really been far. I have been in Toronto and Ottawa, and today is the second day that I’ve actually been home. I was in Toronto (well, Oshawa, really) for a robotics competition with my FIRST robotics team. We had so much fun! We’re at another competition next weekend and we won an award that qualifies us for the World Championships, so we’ll be in St-Louis in about a month for that. I did a bit more baking before I left. 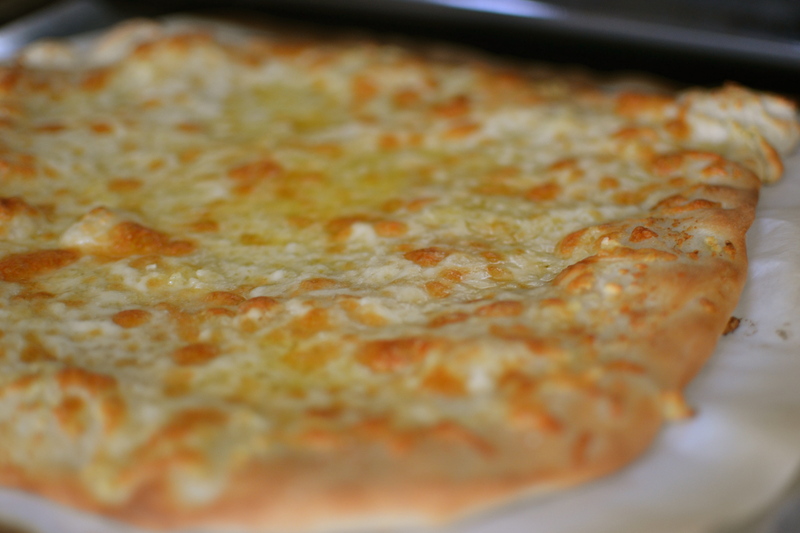 This garlic bread is basically a pizza crust with garlicky butter and a ton of cheese… yum! The recipe is from here. The pizza dough was really easy to make. 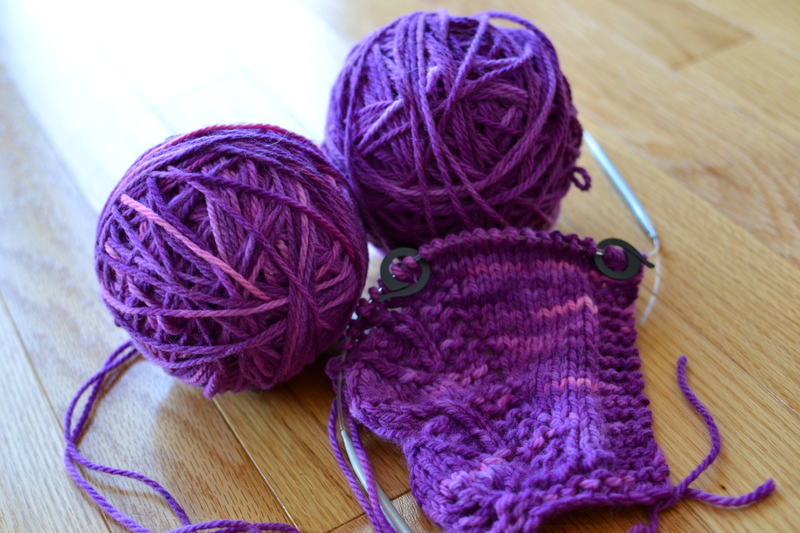 I have gotten some time to work on my Saroyan. I thought I was going to have to readjust the pattern for the amount of yarn that I have, but it’s looking like it will be okay. So far I’ve worked 6 increase sections and 6 body sections. 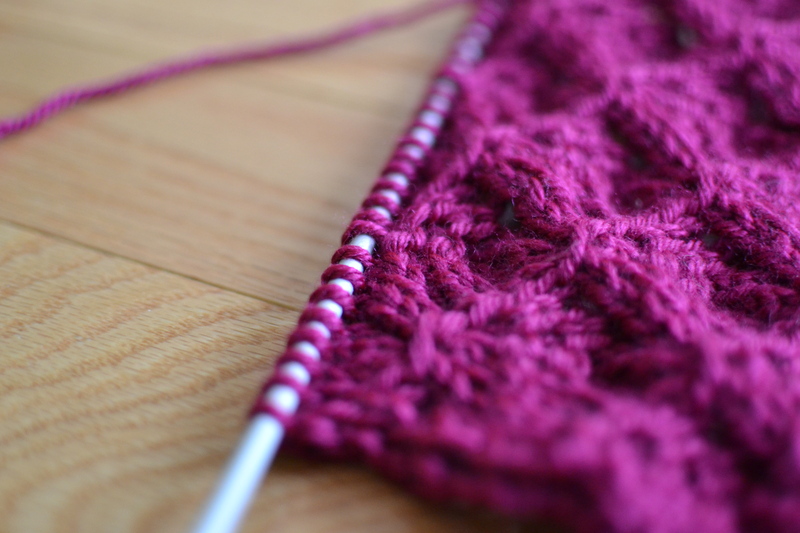 I love how this yarn is knitting up. 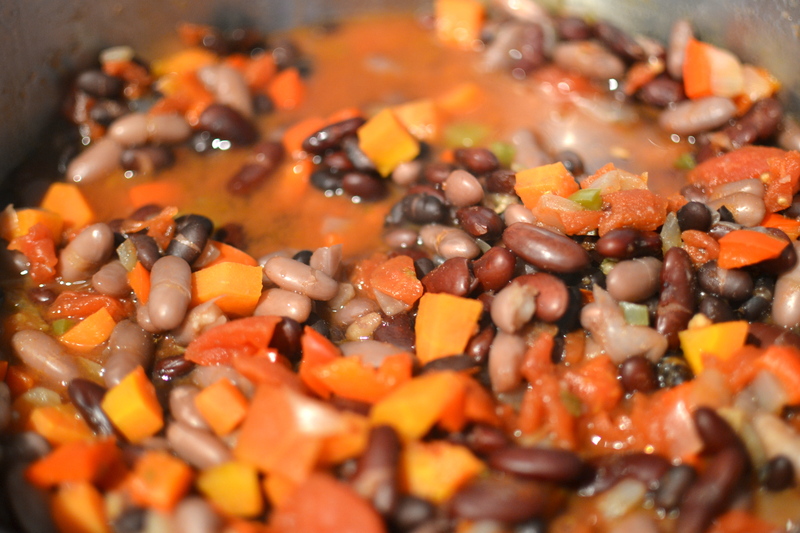 We have family coming over for dinner tonight so there is a giant pot of chill simmering on the stove and it smells fantastic. 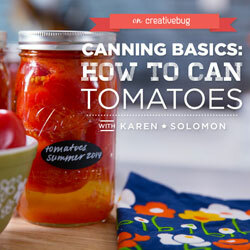 The recipe is from the Better Homes and Gardens cookbook. 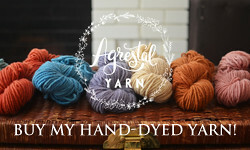 I’ll be yarn-alonging with Ginny at Small Things tomorrow! 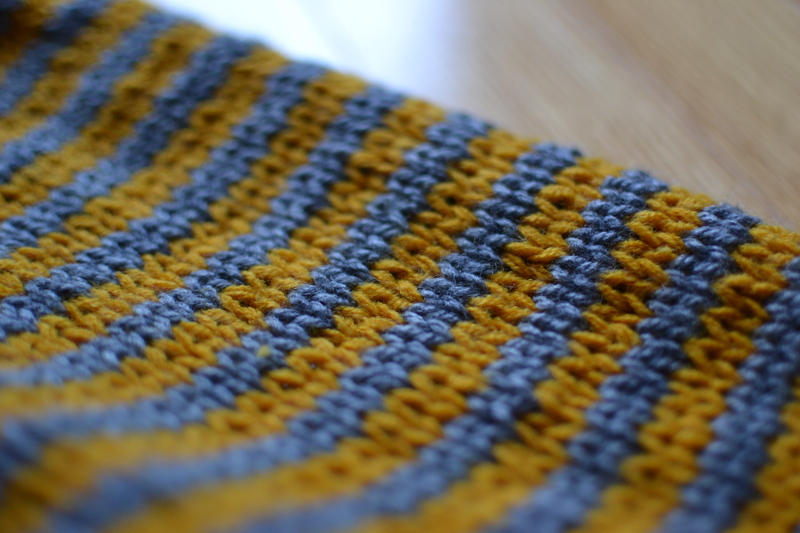 Have you seen my new pattern yet? 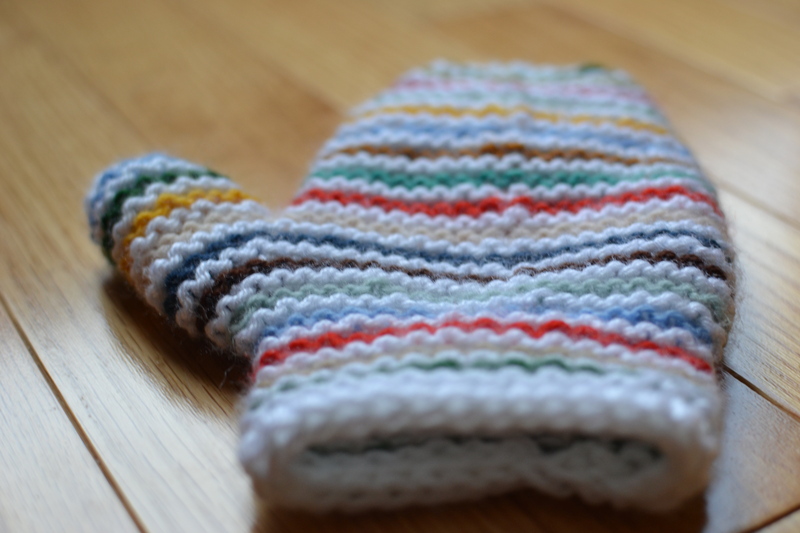 It’s called Crayon Striped Mittens and is available as a free Ravelry download (Download now). 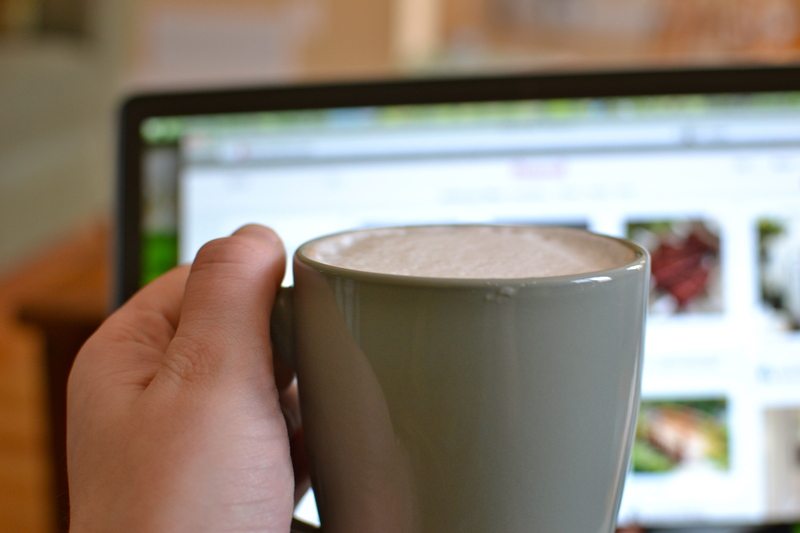 I’ve just got a quick post for today, and then I’ll probably disappear until the weekend. I’m working on some other things, and I’ll be out for town for the day on Thursday (more about that when I get back!). It’s Saroyan by Liz Abinante. The leaves along the edge of this are just gorgeous. One of my Dad’s colleagues was wearing this recently and it was so pretty, I had to make one of my own. 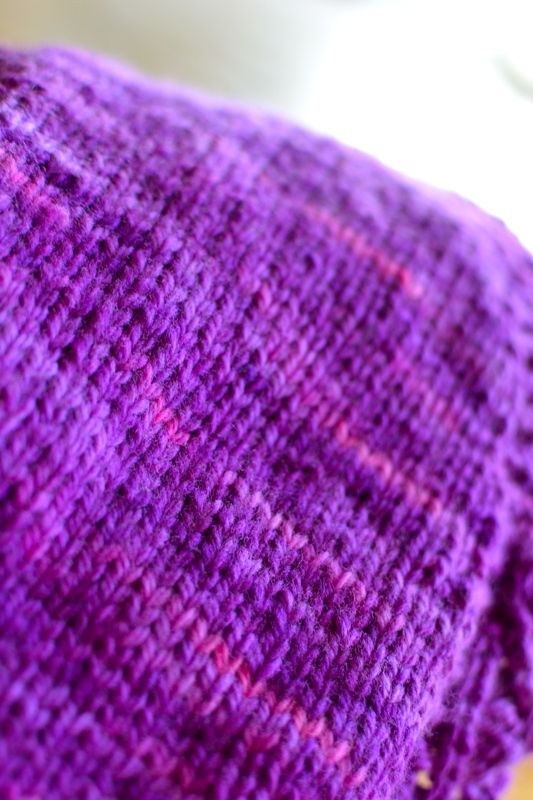 It’s made with Stag Ranch Aran in Heliotrope, by Rocky Mountain Dyeworks. 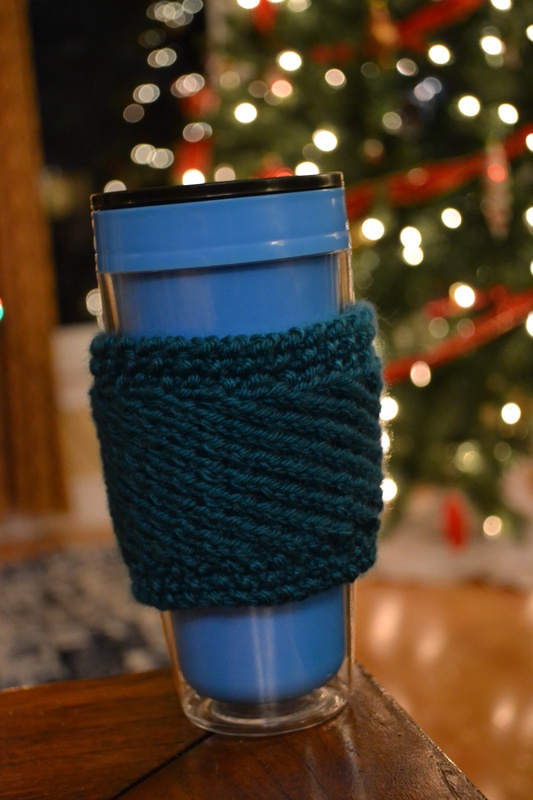 The yarn was a Christmas gift and it is lovely. I like that it’s from an independent Canadian company. Since I only have 340 yards of yarn, I’ll have to do a bit of math to make it work, but the pattern is written so that making changes is really easy. The two skeins that I have are a slightly different colour, even though they are the same colourway. I know that this happens with hand dyed yarn, so I’m not worried about it, but I’ve been alternating the skeins every two rows to make the entire scarf look more uniform. I’m actually really liking the variegated effect it’s creating! 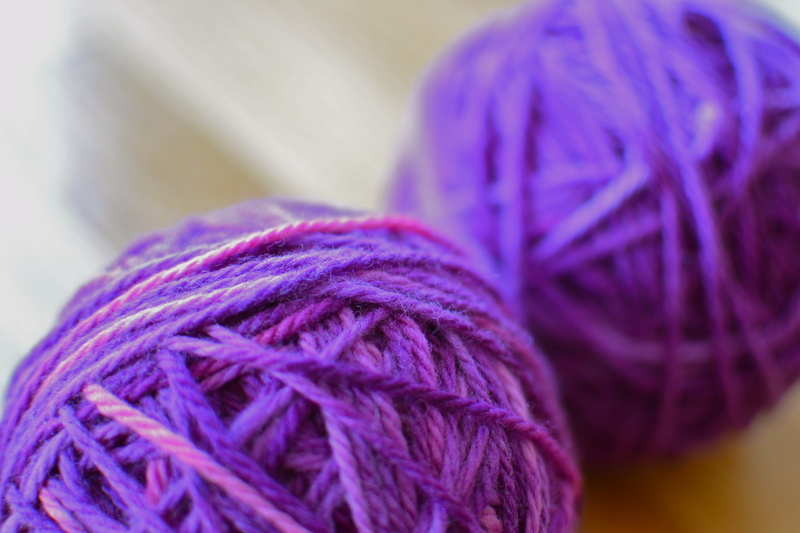 I’ll be yarn-alonging with Ginny at Small Things tomorrow. I started (and finished!) 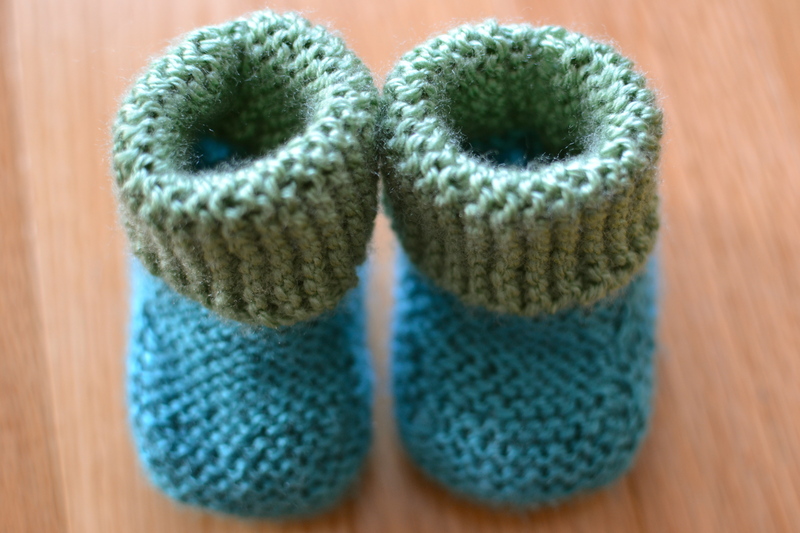 a little blueberry knit set for some good friends who are due to have a baby any day now. I’m really happy with how this turned out and I can’t wait to meet the new baby! 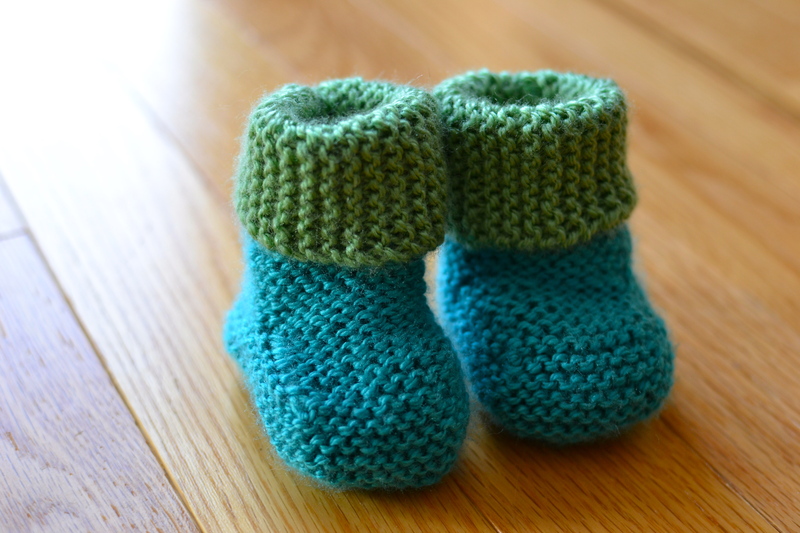 The booties are this pattern. 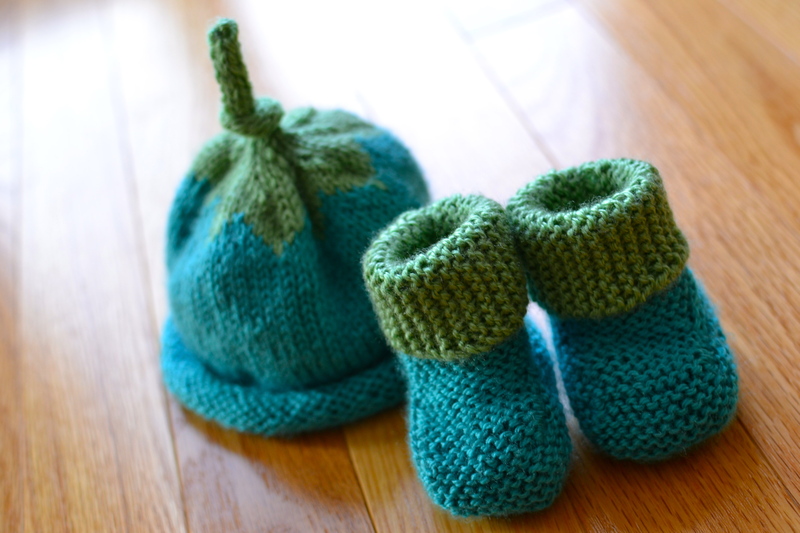 The booties and the hat are both made with Bernat Softee Baby, which is soft… and washable! (On Ravelry here). 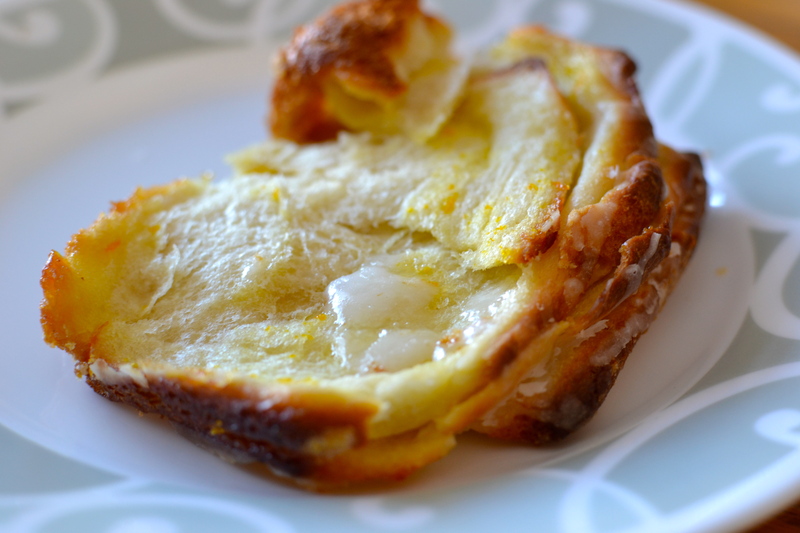 It was messy and sticky, but oh-so-good. 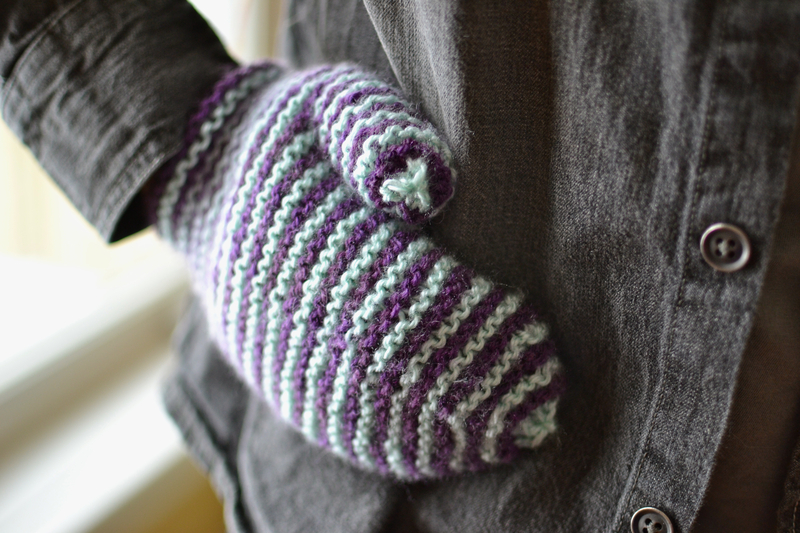 I’m excited to release my second pattern… Crayon Striped Mittens! The pattern is available as a free Ravelry download here. Rushed. That’s what the last few weeks have been. I’m on my school’s robotics team, and we’re part of an organization called FIRST. Basically, we have 6 weeks to build a robot, from scratch. This year’s game is sort of like basketball. This weekend was the last weekend of “build season”, and I spent over 55 hours in a warehouse in 5 days! My team-mates are the best, and I would do it all again… but still, I need some downtime! Needless to say, I’m looking forward to sleeping in this weekend. 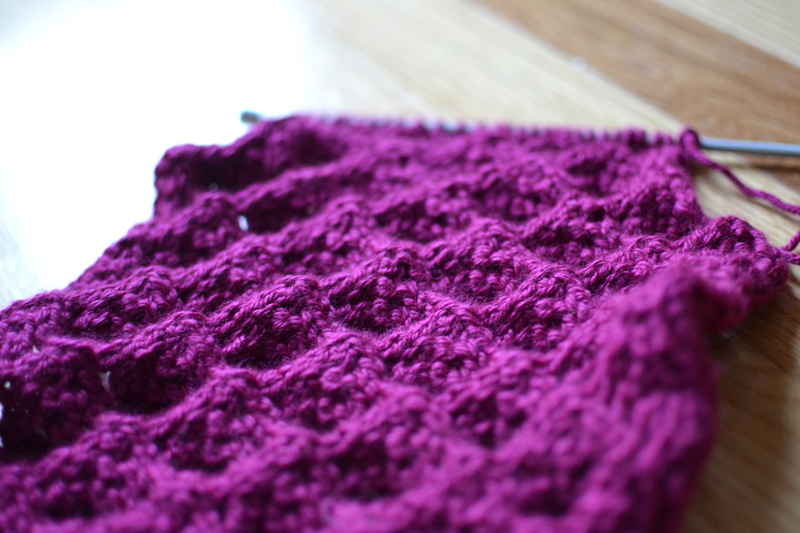 Knitting-wise, over the past few weeks, I’ve been working on finishing some things up here and there. 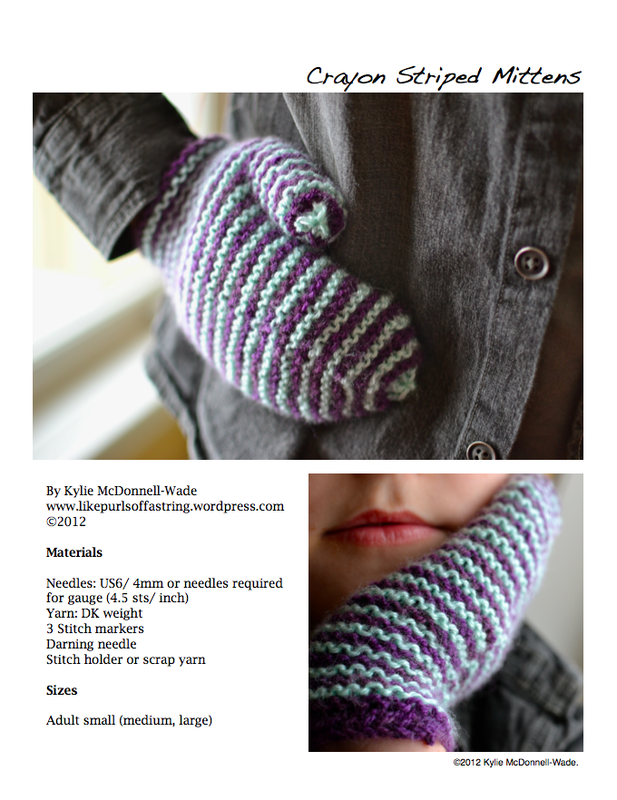 I’m getting my pattern ready to publish this week as well. 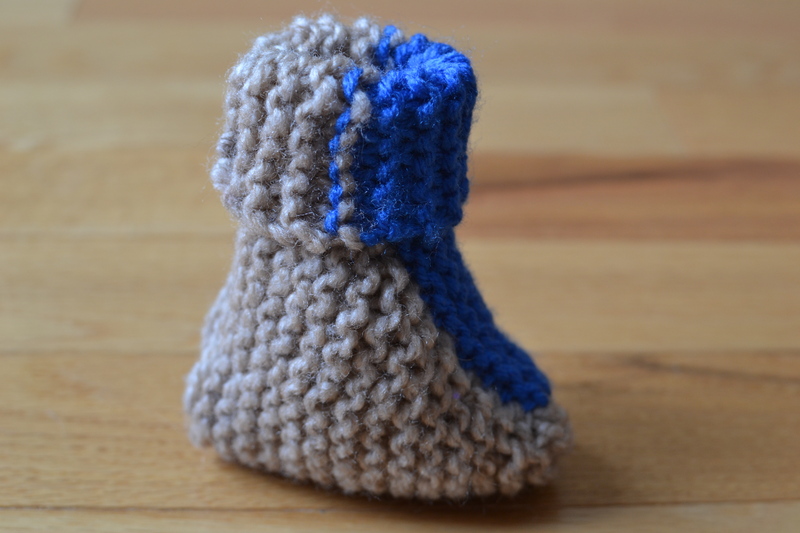 I am also still working on baby things for all of our family friends, the latest being a pair of Saartje’s Booties. I can’t believe I haven’t made these before. I just have to weave in the ends and add the buttons. 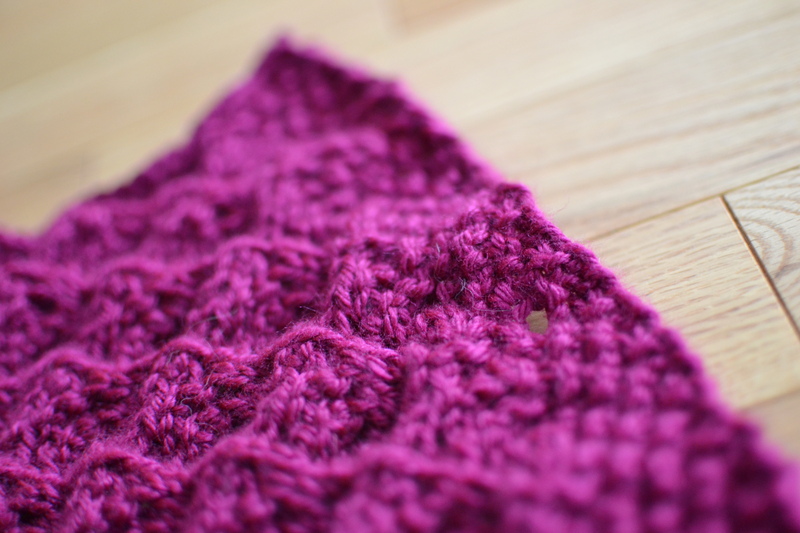 I made a simple scarf in Stockinette Stitch. I’m thinking it might end up being for my dad. I love these colours! 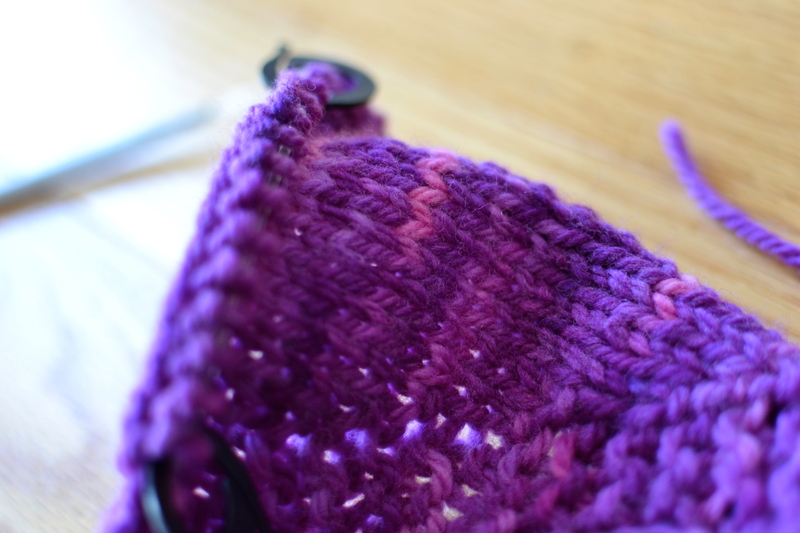 I’m Yarn along-ing with Ginny at Small Things today! Only 2 days until the weekend… Have a great week! 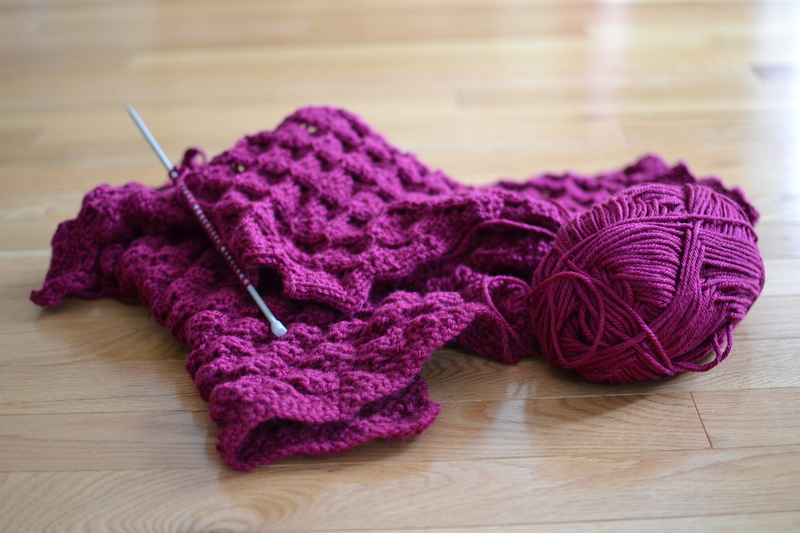 Coming soon… a new pattern! As I mentioned last week, I’ve been working really hard on a new design. I was finally happy with how the finished product looked and wrote up the pattern a few weeks ago. 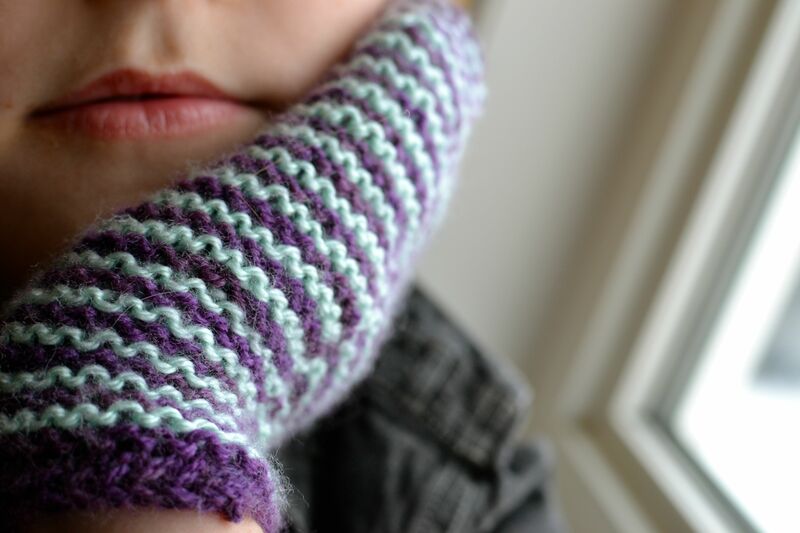 I’m now having the pattern tested and it should be available in the next week or so! 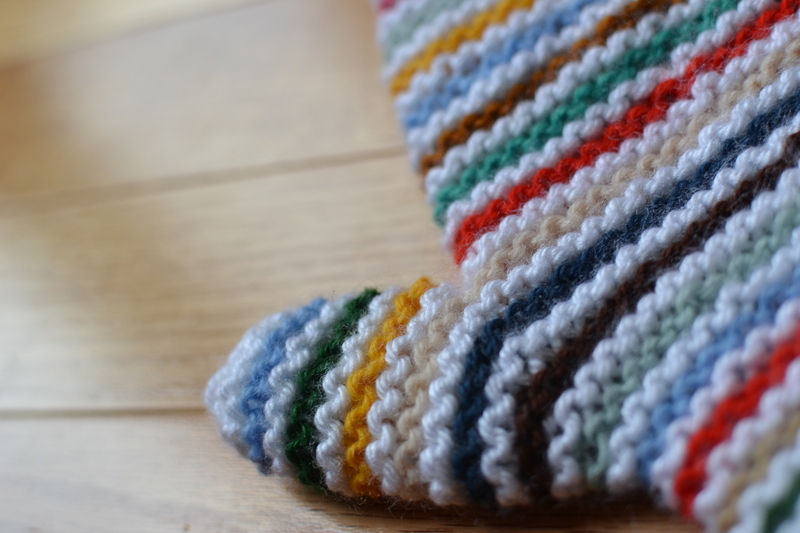 I’ve named the pattern “Crayon Striped Mittens” because picking out the colours for each pair makes me think of picking out crayons from a new box. Being me, of course, I can never make a decision… so if you have suggestions, I’d love to hear them! 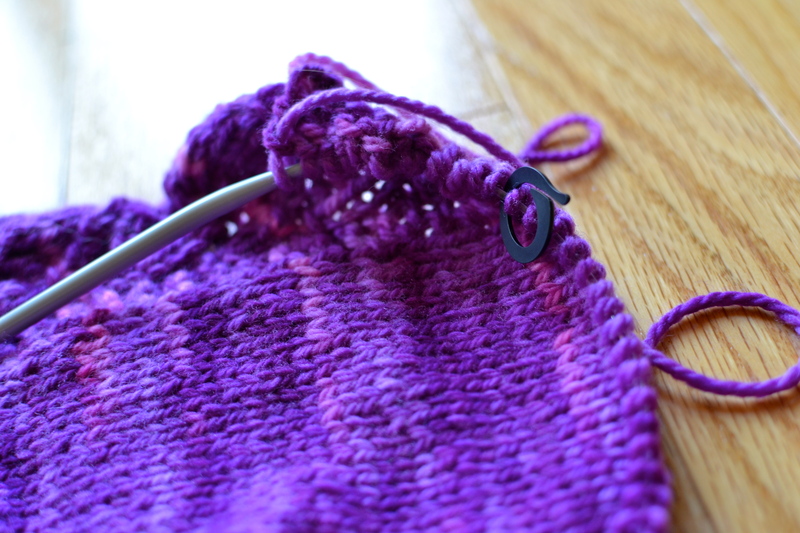 I’m Yarn-Alonging with Ginny at Small Things today. 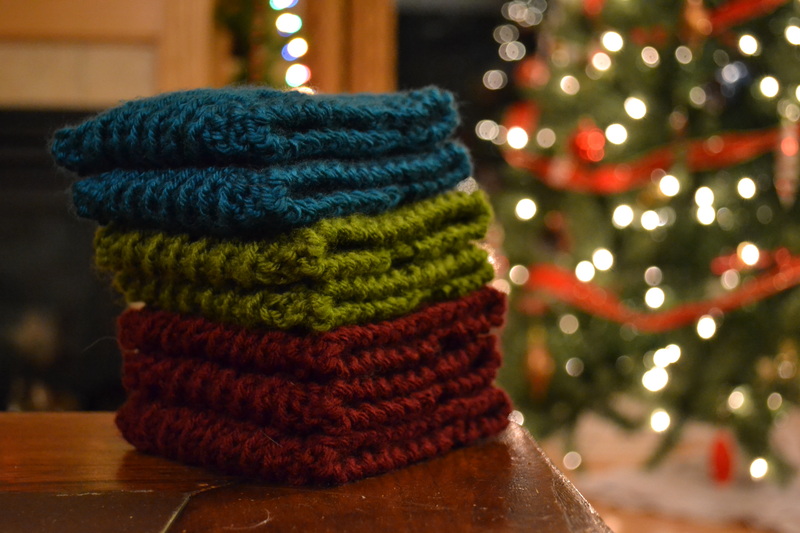 I was actually really impressed with how quickly I managed to finish my Christmas knitting for my family this year, since I was done before December! 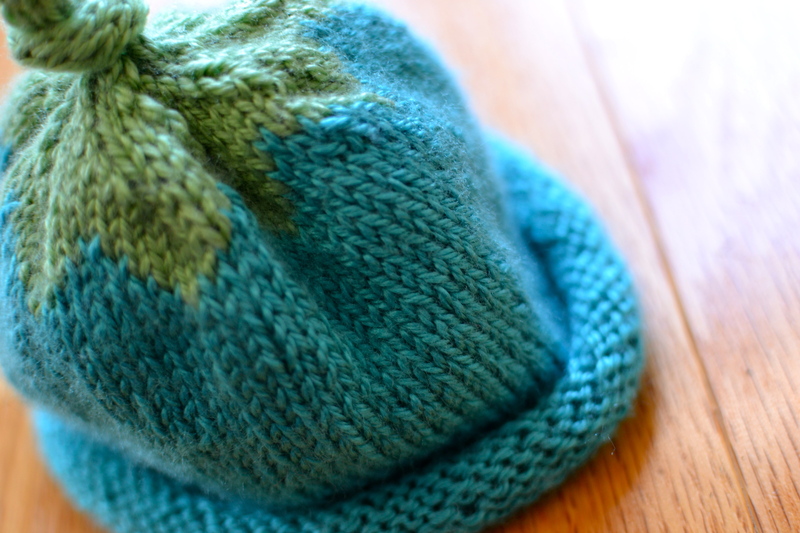 But when it came to mid-December and I still hadn’t knit anything for my friends, I knew it was going to be an interesting time crunch to get it all done. Now that I’ve tracked down all but one person (who swore she wouldn’t read this post!) to give them their gifts, I can finally share pictures! I chose the pattern Corrugated Coffee Cozy. 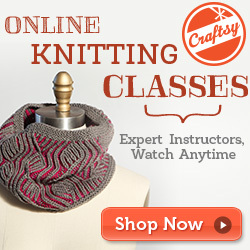 It’s a super quick pattern, knit flat and seamed up the side. 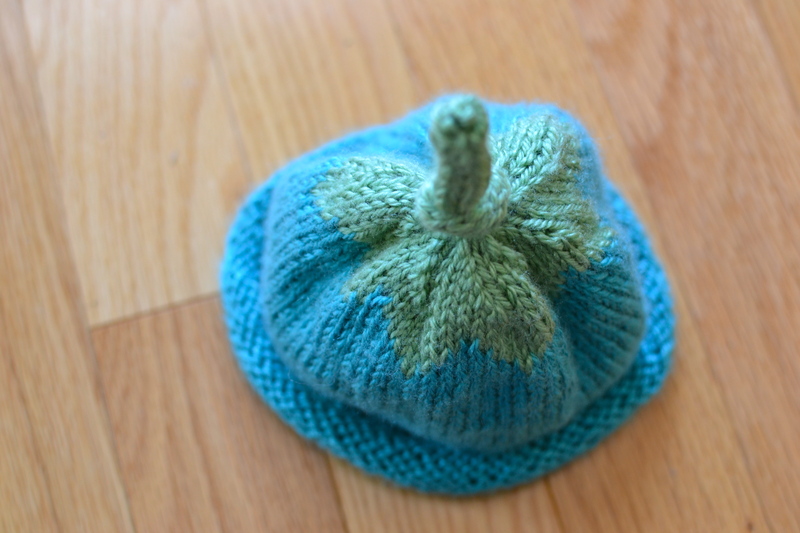 I love the stitch pattern, but next time I make these, I’ll probably try to knit it in the round instead. I’m working on a new design that I’m really excited about. The pattern should be out in the next few weeks! I discovered a fantastic website earlier this week. Pickles has the most beautiful patterns and lovely pictures of all of them. I’m especially loving all of their baby and kids patterns, and they always give one size of each pattern for free, rotating between all of the sizes. I think it’s a great idea! My neighbour is having a baby in February, so I wanted to get started on a few things for her. 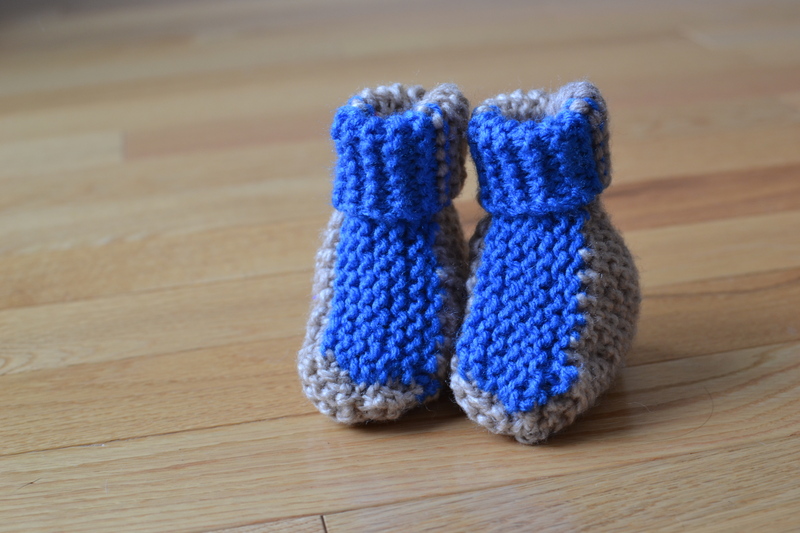 I chose to make the Small and Clever booties, I just love the “pop” of the contrast colour on the beige! 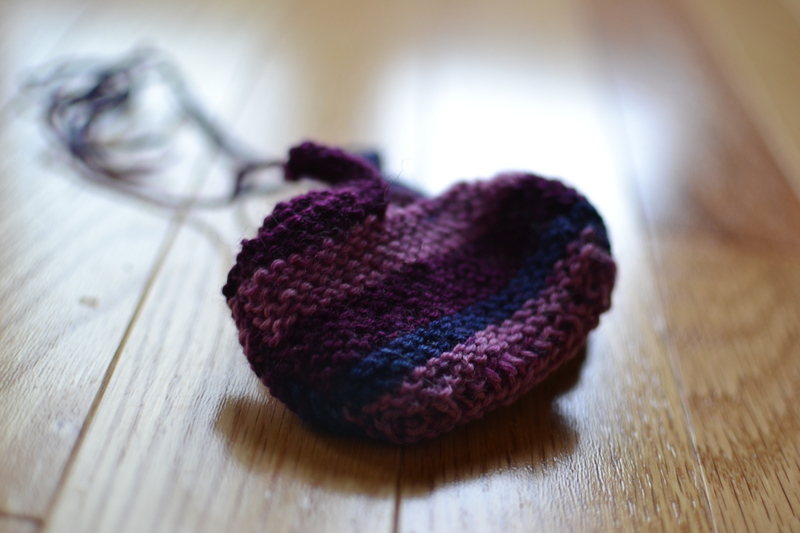 I ran into a bit of a problem when I ran out of the beige yarn with 8 rows left in the second bootie… it required some searching, but I eventually found enough to finish them off. 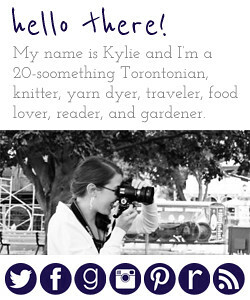 On Ravelry here. Have a great Sunday! 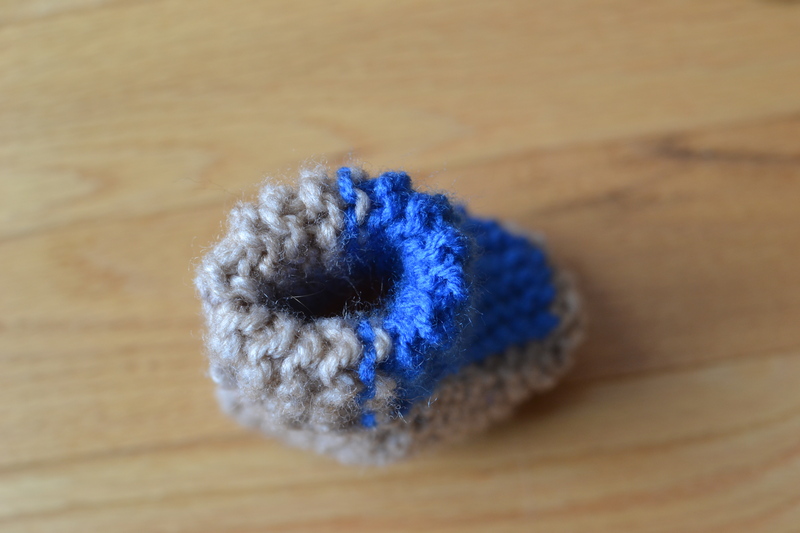 Yarn Along-ing with Small Things! 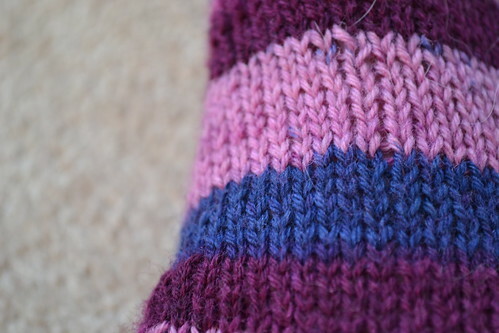 I love hand knit socks, especially purple ones. 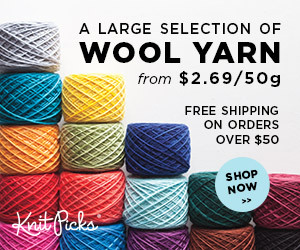 I bought the yarn for these, a wool nylon blend, at Romni Wools when I was visiting Toronto a few months ago. Romni is huge- every time you turn a corner, there’s just more yarn! 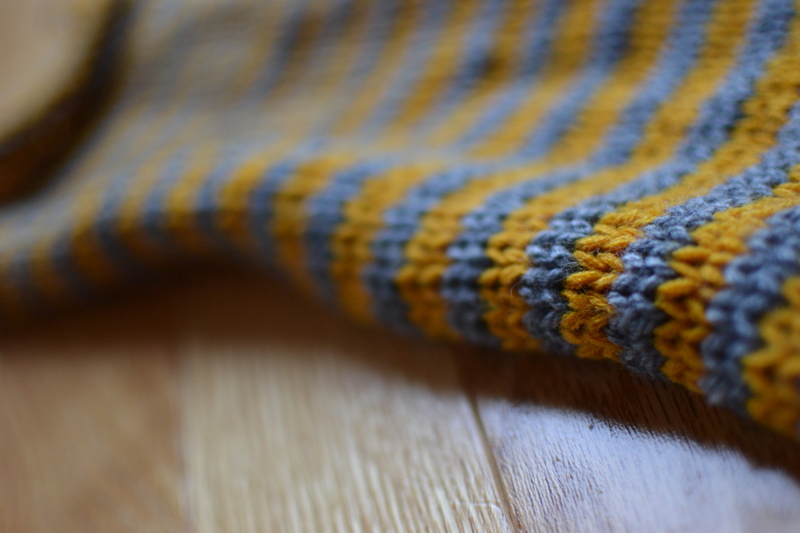 The pattern is my favourite basic sock pattern, Amy Swenson’s Universal Toe-Up Sock Pattern. 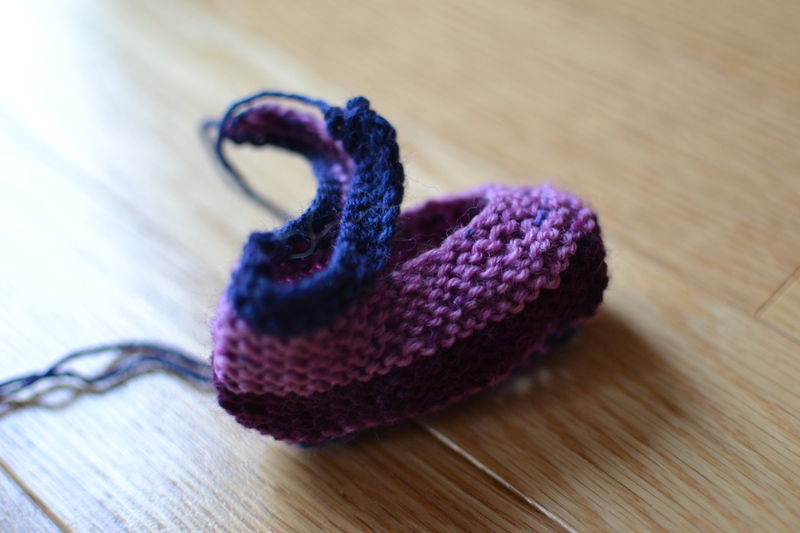 You choose your gauge, needle size, and shoe size, and if you use the Toe-Up Sock Generator, it even does the math for you! 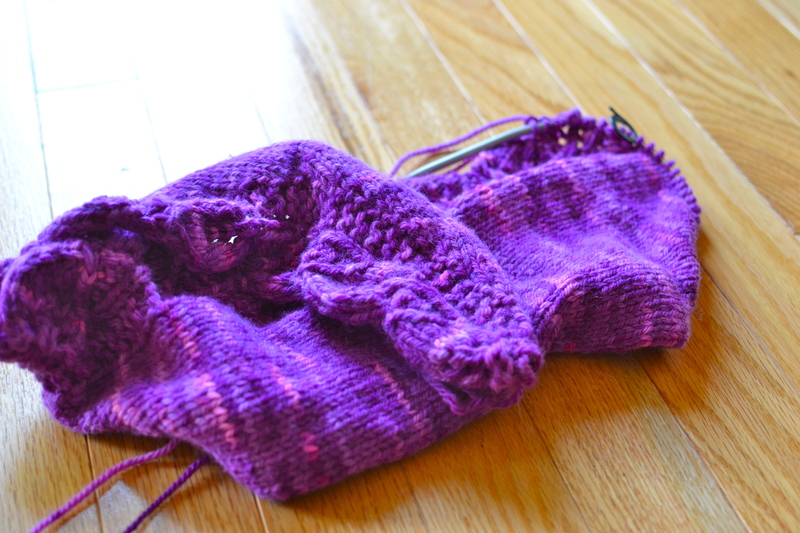 I started the socks on Halloween night and then set them aside for awhile while I finished up some Christmas knitting. 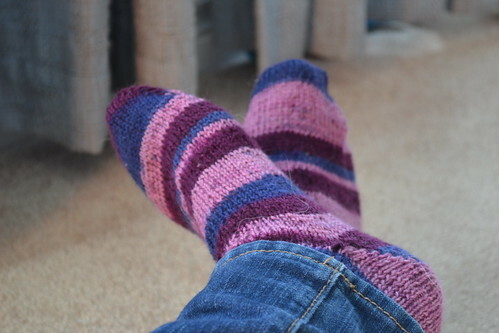 I finally knit the other sock (in one day!) on Boxing Day.